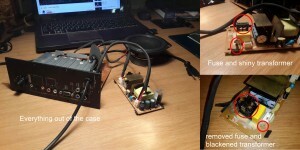 This entry was posted in electronics and tagged disassemble, logitech z506, power surge by Gareth. Bookmark the permalink. were is the fuse for the z506 ? Mine just went out this morning. I was changing the input from my tv to my computer and heard a “zissst” over the speakers and the power light went out. I will disassemble as shown and look at the transformer. I stumbled upon it when trying to disassemble mine – one of the fuses in the apartment was down and when i switched it on the z506 was the only thing not powering up. I checked the transformer and its all blacked and shattered. Any chance anyone knows the details/characteristics for the transformer? Check the update in the last paragraph of the article. I replaced mine with a laptop powersupply. There’s also a link to an online store where you can purchase a direct replacement. Otherwise anything 16-20V 4A+ should do the trick. How did you hook up the laptop psu to it? Did you open up the charger and take out the relevant bit? 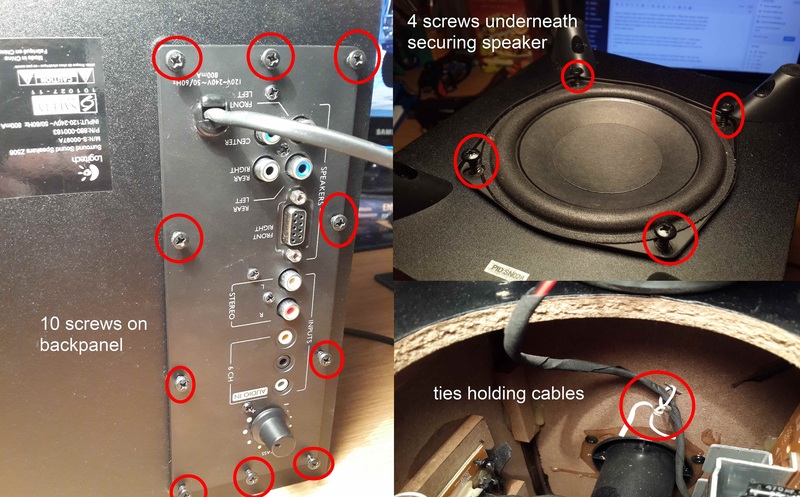 I took the speakers PSU out and cutoff the plug that it connects to the speaker’s amp with. Then I cut off the laptops plug, and switched it for the speaker’s one, so the laptop charger can plug into the amp. I didn’t put the laptop charger in the sub-woofer with the amp, I kept it separate. The connector in red goes from the PSU to the amp. The connector in blue supplies the AC power from your household outlet, let me know if that’s not what you were asking. The PSU no longer works. No matter how much power you put through it, nothing’s going to happen. So I completely removed it. And connected 18V DC (from the laptop charger) directly to the connectors on the wire at the red connection.. Thanks for sharing your solution to this problem Gareth – it’s been very helpful! 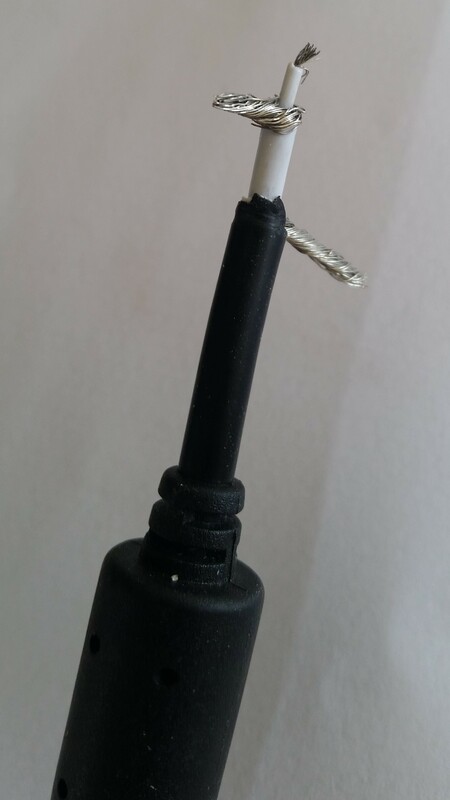 I have a couple of questions about connecting the laptop charger; I was probably a bit naive in believing the lap top cable would simply have two interior cables to connect to the amp but when I cut into my old Dell charger I’m faced with 3 in a coax type structure – (see photo here http://i.imgur.com/SBly9Rj.jpg) – Can you advise please? Also this charger is only 19.5v/3.4A and I have another 15v/4A neither of which fit your guidance of 16-20v and 4A+ but thought I would check if you think either of these might work?… otherwise I’ll keep looking in my ‘old charger box’! Either PSU will probably work, seeing as you’ve already cut open the Dell charger, you might as well use it. Dell chargers have two wires supplying power (a positive and negative) and a third signal wire that tells the laptop what kind of charger is plugged in. Laptops prevent charging using a non-Dell charger. This ‘intelligence’ seems to be only on the laptop side though, and the charger provides full current regardless of what you plug it in to. That being said, the outer wire is ground, the in-between wire is positive and the inner wire is the signal which you can leave disconnected. That being said, if you have a multimeter, I very much suggest checking voltage with it before connecting to your speakers. Do you know what the specifications of the original power supply is by any chance? I’ve just got hold of a Z606 which some had tried to repair the PSU, but failed and binned just the PSU. I’d like to try and get it working, so looking for a power supply I can use that might match the original specs. I don’t know the exact spec. I believe it’s 16V @ 5 A. Anything in the 16-19V range should work. While it may work with just a 2 A power supply, you won’t get full power from it. Take the current amp out, and put a new one in. Any hifi is just an amp + speakers. You can use the speakers in the Z506 with any amp you desire, just need to rewire. What a great article — very well written and understandable! However, I think I’m going to just replace the sub woofer, as I found one on Ebay for $20. I did enjoy your article, though! anyone know how to hot wire the subwoofer to work by it’s self? I suspect connecting a couple of pins on the 9 pin connector will turn it on. Any one have any data on the pin outs? I don’t have my speakers anymore, but the easiest way is probably just to disconnect the wires to the front left speaker, and not plug the others in. Ah. That makes sense. As you suggested, try figure out if there’s a ground pin, or just use the shell. Try short ground and each pin and see if any of them power on the system. There’s also a volume control on the speaker, so you’ll want to get a potentiometer to connect the volume pin to the ground as well. Unfortunately I don’t know which pin is which. You can probably figure out more if you open it up and inspect the PCB. Thanks for the ideas. I’ll give it a try. Surprisingly no info i can find online for the pin out on that 9 pin connector…. I had a Logitech system (can’t remember the Z number) the setup was just two speakers which did everything I asked of it until one day the system just stopped. Logitech kindly provided me with a replacement (different system). I held on to the old speakers and tried a suitable old external PSU’s and it worked just fine so I have 2 sets for the price of one.